From the beginning of MakeCode, a facility was provided to extend the editor with user extensions hosted on GitHub. These extensions can even introduce their own user interface in the editor. Extensions first need approval to surface in search but, unless they are banned, can be loaded without approval by providing an exact URL. Until recently, extension authoring required usage of command line tools (npm and git, along with the required npm packages), which could present quite a barrier to aspiring extension writers. Instead, you can create extensions and publish them to GitHub directly from the web app, without ever touching command line or installing anything. First, you need a GitHub account if you don’t have one yet. GitHub is the largest host of source code in the world, with over 30 million users. Once you have your account, you’ll need to tie the MakeCode web app to your account. To do that, open any project, go to the Gear Wheel menu on top, and select Extensions. At the bottom, there should be a link to log in to GitHub. If there’s no link in your editor, try using its /beta version. A dialog will appear asking you to generate a GitHub token. Follow the instructions and paste the token into the dialog. You’ll need to paste in a token again for each editor you use (micro:bit, Circuit Playground, etc. ), though you can use the same token for all of them. Once you’ve logged in, go back to the home screen. 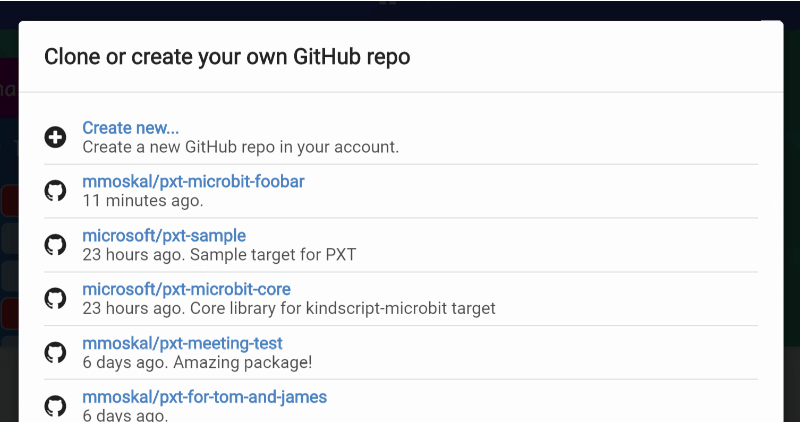 Now, the dialog that comes up after you press the Import button will have an additional option to list your GitHub repositories or create a new one. Additionally, the Import URL option will now support https://github.com/... URLs, which is useful if you can’t find your repository in the list (especially organizational repos), or as way to search the list faster using a copy/paste of the URL. Currently, there is no way to push an existing project into GitHub. As a workaround, create a new project and copy/paste the contents of the main.ts file. Once you have your repo set up, edit files as usual. Whenever you get to a stable state, or just every now and then to keep history and insure against losing your work, push the changes to GitHub. This is done with a little GitHub sync button on top of the Explorer. The button will check if there are any pending changes to check in. If there are, it will create a commit, pull the latest changes from GitHub, merge or fast-forward the commit if needed, and push the results to GitHub. If there are changes, you will be asked for a commit message. Try to write something meaningful, like Fixed temperature reading in sub-freezing conditions or Added mysensor.readTemperature() function. When describing changes, you are also given an option to bump the version number. This is a signal that the version you’re pushing is stable and the users should upgrade to it. When your extension is first referenced, the latest bumped version is used. Similarly, if there is a newer bumped version, a little upgrade button will appear next to the extension. Commits without bump are generally not accessible to most users, so they are mostly for you to keep track of things. There’s really no distinguishing between a commit, push, and pull - it all happens at once in the sync operation. There’s also another button next to the GitHub sync - you can use it to add new files to the project. This is mostly to help keep the project organized. For the TypeScript compiler it doesn’t matter if you use one big file or a bunch of smaller ones. It’s possible that multiple people are editing the same extension at the same time causing edit conflicts. This is similar to the situation where the same person edits the extension using several computers, browsers, or web sites. In the conflict description below, for simplicity, we’ll just concentrate on the case of multiple people working on the same extension. Typically, two people would sync a GitHub extension at the same version, and then they both edit it. The first person pushes the changes successfully. When MakeCode tries to push the changes from the second person, it will notice that these are changes against a non-current version. It will create a commit based on the previous version and try to use the standard git merge (run server-side by GitHub). This usually succeeds if the two people edited different files, or at least different parts of the file - you end up with both sets of changes logically combined. There is no user interaction required in that case. If the automatic merge fails, MakeCode will create a new branch, push the commit there, and then create a pull request (PR) on GitHub. The dialog that appears after this happens will let you go to the GitHub web site and resolve the conflicts. Before you resolve conflicts and merge the PR, the master branch will not have your changes (it will have changes from the other person, who managed to commit first). After creating the PR, MakeCode moves your local version to the master branch (without your changes), but don’t despair they are not lost! Just resolve the conflict in GitHub and sync to get all changes back. MakeCode will also sync automatically when you close the PR dialog (presumably, after you resolved the conflict in another tab). To test blocks in your extension, press the New Project button on the home screen and go to the Extensions dialog. It will list all your GitHub projects as available for addition. Select your extension and see what the blocks look like. You can have one browser tab open with that test project, and another one with the extension. When you switch between them, they reload automatically. For testing TypeScript APIs you don’t need a separate project, and instead can use the test.ts file in the extension itself. It is only used when you run the extenssion directly, not when you add it to a project. You can put TypeScript test code in there. The GitHub feature is not limited to extensions. You can also use it to store other MakeCode projects. You can even use it to collaborate on a project with multiple people. Currently, any GitHub project will show up in your Extensions dialog though. The web app will not let you create extensions with C++. This you still need to do from command line, after installing all required compilers or Docker (depending on target). The good news is that very few extensions contain C++ (mostly because TypeScript is easier to write, test, and in most cases sufficient). The main reason seen so far for needing C++ extensions is the lack of floating point support on the micro:bit (this is now fixed with the v1 release). You can use a non-master branch by going to Import URL and saying something like https://github.com/jrandomhacker/pxt-mypkg#mybranch. User note, this hasn’t been extensively tested yet. MakeCode will generally only download files listed in pxt.json. Files in GitHub but not in pxt.json will be ignored and left alone. The GitHub authoring feature is now available in all MakeCode editors.